NEW YORK — The marble-lined lobby of Trump Tower was standing-room only for the main event: President-Elect Trump’s first full blown news conference since July. The pent-up demand to question Mr. Trump was about to be satisfied. Two hours before the session was to begin, all the seats had already been spoken for. 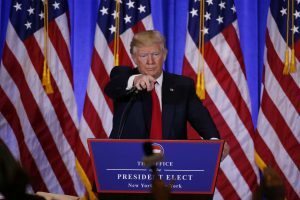 News organizations from around the world were represented: The major U.S. television networks, the BBC (“That’s another beauty,” Mr. Trump sniffed) and someone whose mic flag identified him as being from something called “Cheddar” (“I’m from Monterey Jack,” a still photographer muttered). The venue may be more familiar as the site where the comings-and-goings for audiences with the president-elect are tracked by television cameras. The set-up has meant that people going up to the Trump offices have had to push through the crowd of reporters, as former New York City Mayor Rudolph Giuliani did at one point. Rather than gliding down an escalator as he did for his campaign announcement, Mr. Trump emerged on Wednesday from the rear of a crowded elevator, preceded by his children and close aides, including White House Chief of Staff-to-be Reince Preibus. Why did he stop? “We were getting quite of bit of inaccurate news,” he said, bringing him to the topic of the allegations that Russia holds compromising information about him. Mr. Trump found a rare opportunity to praise news organizations who did not report the details of the dossier. “There were some news organizations will all that was just that that were so professional—so incredibly professional, that I’ve just gone up a notch as to what I think of you,” he said. That brought cheers from his son, Eric, some staffers and a few members of the public who, despite the need for Secret Service-approved credentials, managed to get in. The question of security had come up in December when POLITICO reported that Mr. Trump intended to put longtime security chief Keith Schiller on the White House staff. The retired New York cop and Navy veteran was eventually named director of Oval Office Operations, a job whose exact duties vary from administration to administration. Transition officials took pains to say that security would still be the job of the Secret Service. Schiller made a beeline for the Secret Service agent in the buffer and began an animated, whispered conversation, energetically pointing at the photographer. The agent glanced over at the photographer, quietly and unobtrusively going about his job, and silently gave an almost imperceptible shrug.